To understand the consumer market, you must be part of it. Thinking about your demographic is integral to digital marketing, but there's an added layer to it in terms of advertising on Instagram. You not only need to understand what millennials or Gen Z require but also convey it in a way that's believable. This is very tricky if you're not born after 1990: Millennials are digital natives — they know when you're faking it. Use colloquial language on a platform-by-platform basis. Some platforms prefer more traditional diction or text, such as Facebook. Capitalization on certain platforms can seem informal, such as on Instagram or Tumblr. There's a further step with Instagram, however: Emojis are integral to being relevant on the platform. Don't use slang that you don't totally understand. If your brand is older or not in touch with your younger demographic, hire someone within that demographic. The aim of creating social platforms for a brand is to craft a complete persona — one that has a distinct sense of humor, age, gender, social class and interests. Once these are defined, it becomes easier to work collaboratively on the brand in a way that is undiluted and interesting. By defining the ideal consumer for your brand, you can clearly identify what that persona should sound like. This social persona does not need to be the same across all platforms, as often people have different personas depending on the platform. However, there does need to be a sense of continuity between them. Recently, Instagram revealed that the four grid was coming. This sent marketers into a frenzy everywhere, specifically those who were taking advantage of Instagram's format to create horizontal images spanning over three photos on a feed. Instead of waiting for this update to maybe happen (or maybe not) and deal with the consequences afterward, make sure your aesthetic strategy has room for updates. A key example of this: We've started to add a fourth image to rows of three and archive the first image. This allows our clients' current scheme to look cohesive while preparing for an unprompted update, should Instagram choose to implement the four grid. Another way you can allow your aesthetic strategy to grow is by keeping a color scheme that is relative, not concise. For example, instead of creating all of your images with the exact same background, color scheme and placement, carefully consider all of these elements but also allow for content to flow between colors. If a client is a handbag retailer, chances are that each collection will have a different style and color combination. To keep their feed cohesive, make sure all images are shot with the same type of camera, in similar formats, with a similar variety of props, lighting, etc. If you're using social media as a selling tool, your industry must be visual-centric. There are many businesses that aren't in these industries and use social media for a combination of community management, branding or all three. Regardless of your social media strategy, there must be a consistent flow of F.L.U.F.F. — fun, lighthearted, user-friendly — content for organic campaigns. If your Instagram feed is constantly flooded with calls to action to purchase products or services, users are going to tire of your content very quickly. To make thumb-stopping content, it has to be relevant to the interests of your targeted demographic. This might be issues that your target demographic frequently find annoying, funny, interesting or otherwise entertaining. Always refer back to your platform persona — content must be well-rounded. 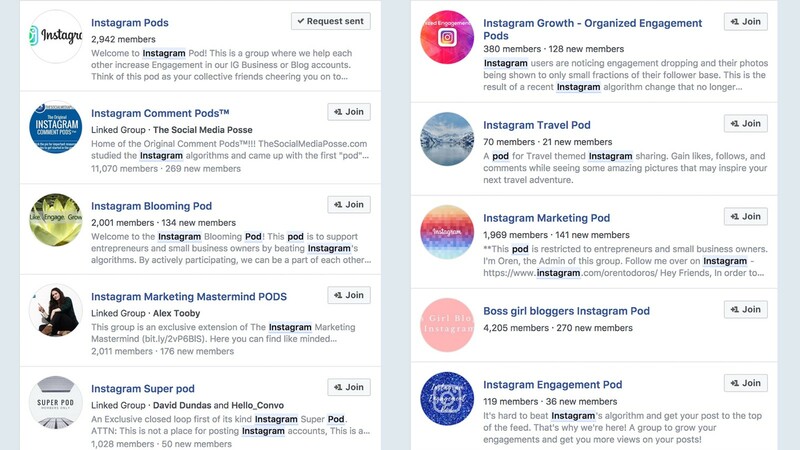 Pods — small, private groups of Instagrammers or businesses with similar audiences — are designed to increase Instagram engagement. Ideally, Instagram pods should be vertical specific — for example, fashion, travel, food or automotive, etc. The use of pods can increase the likelihood of being placed on the Explore page, thus working around the non-chronological algorithm update. Avoiding controversial issues doesn't work on social media as it once did within traditional media. Where dialogue surrounding a particular ad or campaign used to be confined to verbal conversations or news coverage, there is now two-way glass separating the marketer from the audience in the form of the comments section. It doesn't require a large amount of effort for a customer to reach out to a company and discuss why they didn't like their ads before, so even small issues can (and will) be addressed. Instead of retreating further into bland, safe content, address this head-on. When controversial issues come up, ask your audience how they feel. Instead of ignoring issues altogether, showing empathy and human traits will typically make Gen Z trust you more. There are, of course, many exceptions to this. For example, issues that are overly controversial, such as politics, can alienate your audience. However, there are many other issues that can be discussed that weren't touched on heavily before in traditional marketing, such as mental health support, women's rights, etc. Breaking the fourth wall can also be as simple as noting the weather outside or asking if anyone has watched a particular movie or TV show. Creating a comprehensive digital strategy can be tricky for older marketers. It requires extensive research into pop culture and social media trends to rejuvenate older marketing techniques and develop captivating content in order to remain relevant in today's digital marketing space.